Yesterday my daughter turned 20, no more teenagers in this house anymore. It is bittersweet though, I miss the days of my kids being young but I am so happy to see how they are flourishing as young adults. I took this photo yesterday our on the patio, after all the rain we have had in the past month we had a beautiful, sunny day. 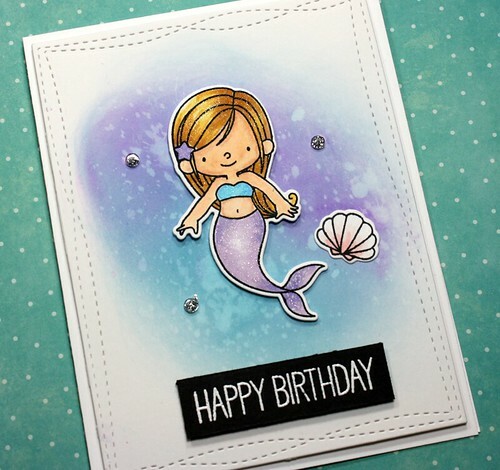 She will always be my little princess and I knew she would love a card made with the MFT Stamps Mermazing stamp set. I sponged my background using Wilted Violet and Broken China Distress Oxide inks and spritzed it with water and then lifted the water with a paper towel. I die cut the panel using the Wonky Stitched rectangles The images were coloured with Copic markers. I am really trying to learn how to colour hair and work on shading my images. The sentiment was stamped with VersaMark and white embossed. 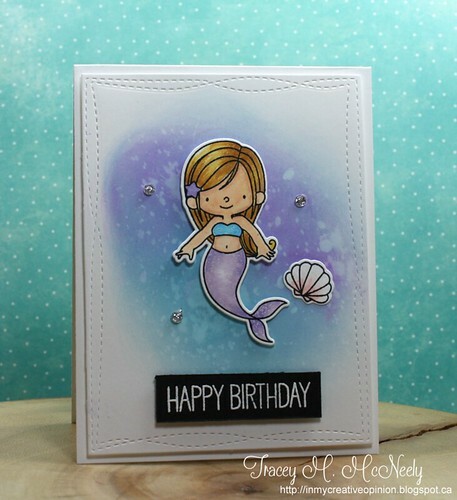 The panel, mermaid and sentiment were all added to the card base with foam tape. Finally I finished the card off with a few sparkling clear Stickle filled sequins. Happy birthday to your daughter!!!! She is beautiful! LOVING the card you made for her!! 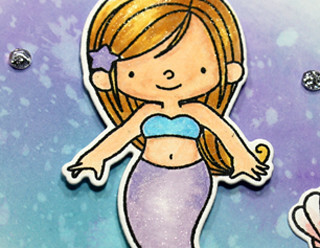 LOVING that mermaid!!!!!!!!!!!!!!!!!!!!!!! Your card is adorable Tracey and so is your daughter. Cute as can be! I miss my kids being young too, and I totally agree how gratifying it is to see them become flourishing adults. A very Happy Birthday to Brooklyn! Your card is fabulous--wonderful coloring! Love the glimmer! Oh....your little mermaid is as adorable as Miss Brooklyn! Love all the wonderful detail in your card and that background is so beautiful. Wishing Brooklyn and wonderful 20th birthday, she is a beautiful young lady. The time passes so quickly, my Godson just turned 21...seems he was just a toddler yesterday. What a wonderful and sweet card for your daughter. Happy Birthday, Brooklyn! Love the card, Tracey - the shimmer is perfect! I'll bet she really loved this charming card! Your Copic coloring is lovely, and honestly, I think her hair looks great! I also love how you created your background...it adds so much texture to this sweet card! Your daughter is beautiful!! LOVE that mermaid you created. The coloring is fantastic! !